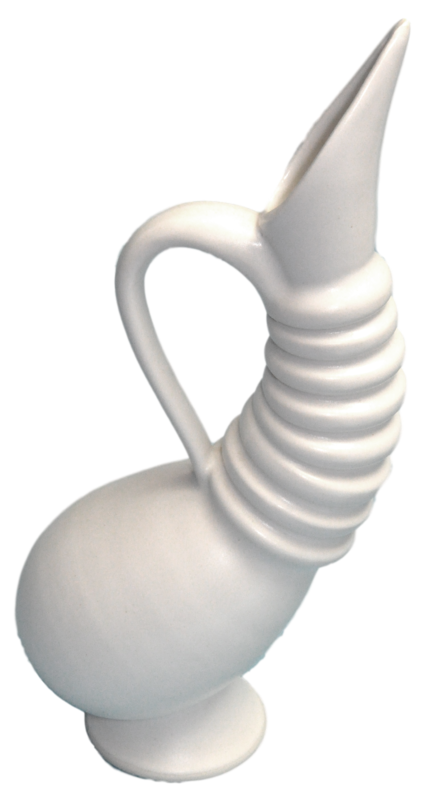 Buying handmade ceramic pottery is an affordable way to start an art collection and NOW is the time to buy. Artisans are transitioning the medium from folksy to sophisticated and it's easy to find some beautiful pieces at reasonable prices that will show off your savvy style. Here's a few of the potters that show their work in our gallery. Gary McKague is a friend of mine. He's been peddling his handmade ceramic pottery on the Canadian craft show circuit for more years than he wants to admit...loading and unloading his crates at shows in Toronto, Ottawa, Calgary and Vancouver and all the small shows in between. Nowadays Gary lives on the shores of Lake Winnipeg where he fires his hand built raku boxes, plaques and sculpted ornaments in a barrel on the beach. 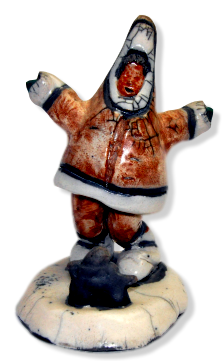 Gary's themes are truly Canadian...polar bears with attitude, geese on the wing, buffalo on the move and Inuit drummers and dancers. Each piece is hand built...no molds allowed. The boxes are intricately cut and pieced together perfectly and each ornament is individually sculpted. His commissioned pieces are in collections across the country and in Europe. He received formal training at The Forum Institute in Winnipeg an credits mentor and longtime friend, Jordan van Sewell for teaching him how to work with clay and encouraging him to stretch the boundaries of the medium. Recently Gary was presented with the "Most Innovative Gallery Product" at the Uniquely Prairies juried art show in Edmonton. Lilach Lotan's first encounter with clay was in 2000 when she was studying design at Israel's Bezalel Academy. After graduation she and her husband Ron, a gemologist, immigrated to Canada because she says "the Israeli culture didn't support an artistic lifestyle". In the ensuing years Lilach has introduced a fresh spirit into the Canadian pottery scene and has defined for herself a signature style. Her work continues to evolve and I think that a hundred years from now her pieces will be the treasures admired on the Canadian Antiques Roadshow. In 2005 Lilach was the first non American to win the coveted Niche Awards given by the Rosen Group. They're the ones who organize the hugely successful Philadelphia Buyers Market of American Craft and publish Niche and American Style magazines. She received the award in the category of "Most Marketable Functional Ceramics" with her funky egg cup. She repeated the performance the following year with her "Jug with Attitude". Also in 2006 she was declared the most promising emerging artist by Ceramics Monthly magazine and two of her pieces have recently been featured in "500 Pitchers" and "500 Plates and Chargers" by Lark Books distributed worldwide. Dawn Candy is a visual artist living and working in Red Deer. She earned her Bachelor of Arts degree from the University of Lethbridge where she dabbled in world religions, analytic philosophy and history. It wasn't until she went on to get a diploma in Visual Arts from Red Deer College that handmade ceramic pottery became her focus. Currently she teaches several community art classes in addition to making and marketing her own work. Her pieces are mainly built on a wheel then altered intuitively by adding or carving away the clay which gives the finished work a dynamic texture. She says, "Mine is a collection of functional ceramics inspired by rhythm, pattern, and landscape...both wild and cultivated and by natural forces including the wind and tides. When her pottery is used on a daily basis by her customers she says, "I hope it conveys a sense of elegance, but also the wonderful playfulness I feel in making it." 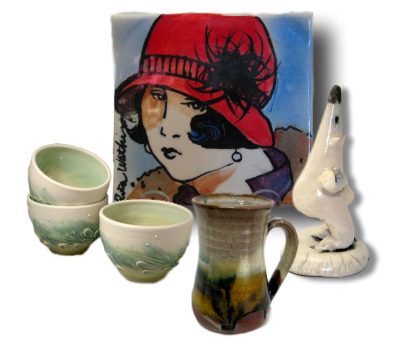 Handmade ceramic pottery has been a part of life since her graduation for Alberta College of Art in 1989. She and her husband opened their East Coulee studio,Caracol Clay, in the heart of the Alberta Badlands ten years later. The studio store was once a 600 square foot coal miner's home. It's open year round to visitors who come from all over the world to explore the Canadian Badlands and visit the Royal Tyrell Museum in Drumheller. Images of the barren hillsides and reproductions of fossilized trilobites and starfish show up on Janet's pottery and they're indications of how much the Badlands have influenced her. 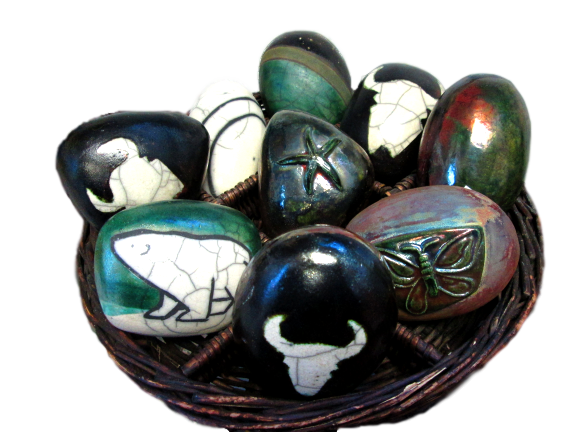 Raku "rock" rattles are one of her big sellers...often inscribed with footprints, buffalo skulls, butterflies and dragonflies. Ceramic artist Rita Watkins works in her California studio surrounded by orchards and vineyards and that makes me wonder what I'm doing here in Rattlesnake Gulch, Alberta. 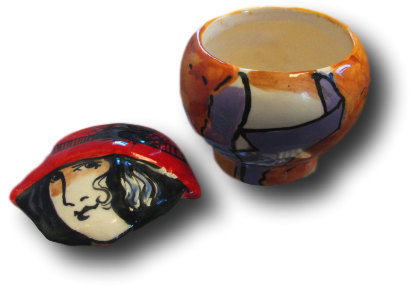 Rita makes little pots...little pots with lids decorated with images of women wearing hats. Delightful. Although the artist is formally trained in the use of acrylics, oils and watercolours, her work in clay has evolved simply from experience and experiments. Her technique of layering underglazes achieves the painterly style that decorates her pottery tiles. Rita's "Paper Doll Collection" is inspired by the vintage fashion paper dolls of her childhood but are named after friends and family members. 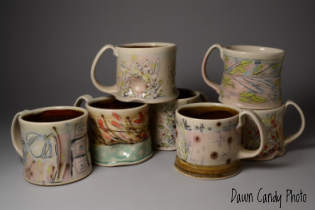 Click here to read the saga of what goes into making a handmade ceramic mug.